A small notebook found on suspected New York and New Jersey bomber Ahmad Rahami when he was captured praised the American al-Qaida cleric Anwar al-Awlaki and included "jihadist-type" writings, law enforcement officials familiar with the investigation tell NBC News. There was also mention of a former top ISIS propadandist, the chairman of the House Homeland Security committee said Wednesday. "It's clear from this journal that Mr. Rahami was receiving inspiration form the ISIS spokesman," Rep. Mike McCaul (R-TX) said. A senior law enforcement official initially said a note was found attached to a pressure cooker bomb left on 27th Street that did not explode. Later, though, investigators said it was a notebook, and it was found in Rahami's possession when he was captured Monday following a shootout in Linden, New Jersey. Two Linden police officers were wounded in the shootout with Rahami, a 28-year-old naturalized citizen born in Afghanistan. They are expected to make full recoveries, and both cops have been released from the hospital. Officer Angel Padilla, a 15-year veteran of the department, was likely saved by his bulletproof vest. Officer Peter Hammer, a 22-year veteran of the department, was struck in the head by a bullet fragment, the injury still visible and his emotions raw as he was wheeled out of University Hospital in Newark to applause from fellow officers. "I feel like I was shot in the head. I'm just glad to be alive, glad to be home," he told NBC 4 as he went home to recuperate, accompanied by a motorcade. Police Chief Jonathan Parham said he was proud of the officers and they in turn were proud to be Linden police officers. Rahami, who was shot 10 times, remains hospitalized. He has been charged with five counts of attempted murder of a law enforcement officer, and is expected to face federal charges related to bombs that exploded at the site of a Marine 5k race in Seaside Park, New Jersey, and in Chelsea. Federal officials say surveillance video shows a man believed to be Rahami at the scene of the Chelsea explosion and also at the 27th Street scene where the second pressure cooker device was left. Additional details about the contents of the note weren't immediately available. Rahami allegedly built four explosive devices, federal investigators said Tuesday. 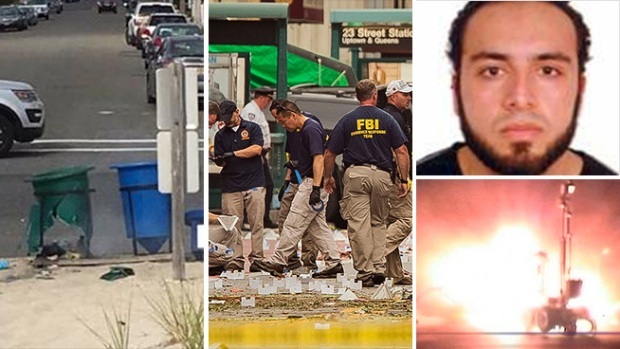 They allege he planted two pressure cooker bombs in New York City, the one on 23rd Street that exploded and the one on 27th Street that didn't, and a device made of three pipe bombs in a trash bin in Seaside Park. Federal investigators say Rahami also allegedly built a multi-part device that was found at a commuter rail station in Elizabeth, New Jersey, late Sunday prompting a series of transit disruptions, but it wasn't clear if the device was planted there with the intent to cause harm or tossed in an effort to get rid of evidence. The revelation about the "rambling" note comes as authorities investigate a potential motive in the bombings. Mayor de Blasio called the bombings an obvious "act of terror" at a news briefing Monday, but officials have said there is no indication Rahami was connected to any local terror cell. No other suspects are being sought in relation to the bombings, officials have said. Authorities also said that Rahami was not on any federal terror watchlist or on the NYPD's radar prior to Saturday's attack. The devices were made with commonly available materials that can be bought without raising law-enforcement suspicions, authorities say. The same kind of cellphone was used as a trigger on at least three of the devices, and the phones were all bought at the same New Jersey discount store. Fingerprints led to Rahami, officials said. The devices weren't all the same though, federal investigators tell NBC News. 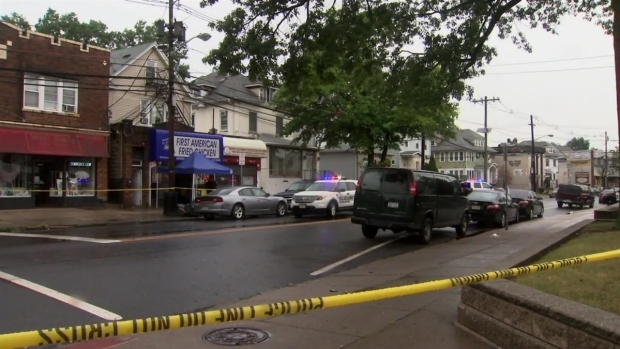 The New Jersey pipe bomb contained black powder as the explosive, while the pressure cooker that went off on 23rd Street contained a mixture of ammonium nitrate (or fertilizer) and aluminum powder. It also contained ball bearings and BBs to act as shrapnel, and was placed inside a nylon bag with a zipper. Nearly every piece of the bombs recovered is readily available at sporting goods stores, corner convenience stores or on the internet. The instructions for building them is a mere Google search away. Using pressure cookers to house bombs was popularized years ago by Inspire magazine, an English-language online publication produced by an al-Qaeda affiliate and used by the brothers who bombed the Boston Marathon in 2013. They too were followers of al-Awlaki, the American-born al-Qaida-linked cleric killed in a U.S. drone strike in 2011. But while pressure cookers are advocated by terrorist organizations, their use does not necessarily suggest that someone received specialized training or was under the control of a foreign group. "It's not that difficult to go on the internet, find out what explosive compounds are out there, where they're available — either through internet order or retail stores" and then create them on your own, said John Cohen, a top former counterterrorism official at the Department of Homeland Security. The fact that different materials were found in different explosives suggests that the suspected bomber likely acquired the materials online or simply used whatever was readily available, he said.